Mellone U., López- López P., Limiñana R., Urios V. 2010. Weather conditions promote route flexibility during open ocean crossing in a long-distance migratory raptor. International Journal of Biometeorology in press. López-López P., Limiňana R., Mellone U. & Urios V. 2010. From the Mediterranean Sea to Madagascar: Are there ecological barriers for the long-distance migrant Eleonora's falcon? Landscape Ecol. 25(5): 803-813. Agostini N. & Logozzo D. 2000. Migration and wintering distribution of the Marsh Harrier (Circus aeruginosus) in southern Italy. Buteo, 11:19-24. Agostini N., Logozzo D. & Coleiro C. 1999. The orientation/navigation hypothesis: an indirect evidence in migrating Honey Buzzards. Rivista italiana di Ornitologia, 69:153-159. A southern Indian temple at Thirukalukundram near Chengalpattu is famed for a pair of Egyptian Vultures that have reputedly visited the site for "centuries". These birds are traditionally fed by the temple priests and arrive before noon to feed on offerings made from rice, wheat, ghee and sugar. Although punctual, the failure of the birds to turn up was attributed to the presence of "sinners" among the onlookers. 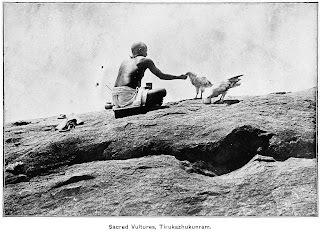 Legend has it the vultures represent eight sages who were punished by Shiva with two of them leaving in each of a series of epochs. 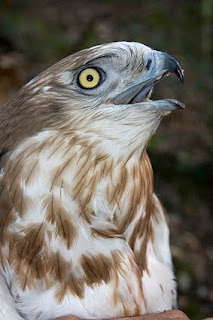 Nic, the first Short-toed Snake Eagle tracked from Basilicata, arrived in Northern Africa crossing the Mediterranean Sea at the Strait of Gibraltar while the other one is still in Southern Spain. Clik on the picture below. Autumn observations at the Straits of Bosphorus and Dardanelles came to an end with succesfullresults. 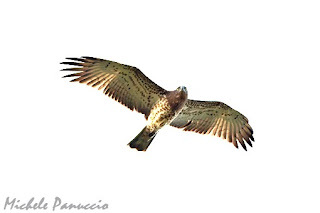 Tens thousands raptors have been seen migrating en route to Africa. A more detailed report will be given in the next days. The very last moment at Toygar Tepe (northern Bosphorus) has been great for the close passage of tens of eagles. Here below one picture of them.